Temporary layoff notice is used to float notice among employees for temporary layoff of staffs due to certain reason which can be a financial crisis, or end of any particular project. It is also used to provide the notice to temporary workers mentioning their end of the requirement for the particular work for which they were hired. Nowadays, in this world of economic crash, permanent employees have even been terminated in bulk as the company cannot pay them. In that case, the company provides prior notice through layoff notice, so that employees may search for better opportunities. These templates include reasons for why the decision is made, and is also intimated to employees. These notices have to be legally correct. This notice is used to allow people with two options, either for transfer of employees’ or layoff. The option is provided to them as per project’s demand. The choice and reason is given to employees and they are asked to get back to management mailing their choice. 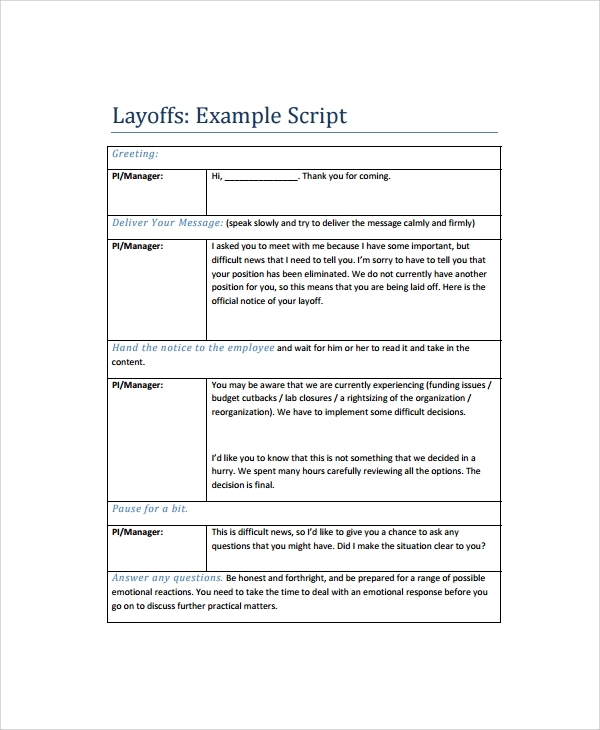 These layoff templates include the time frame and also mention all the further activities which are to be performed by the company and the employees. 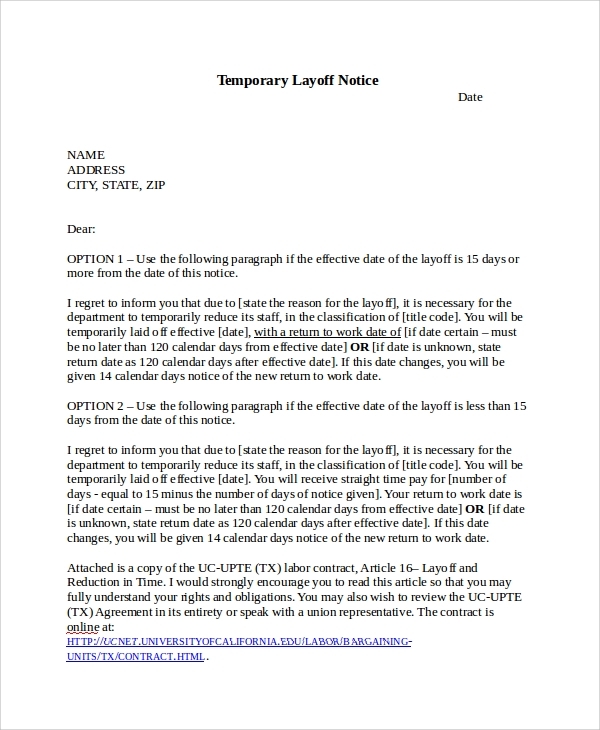 When do I need Layoff Notice Templates? 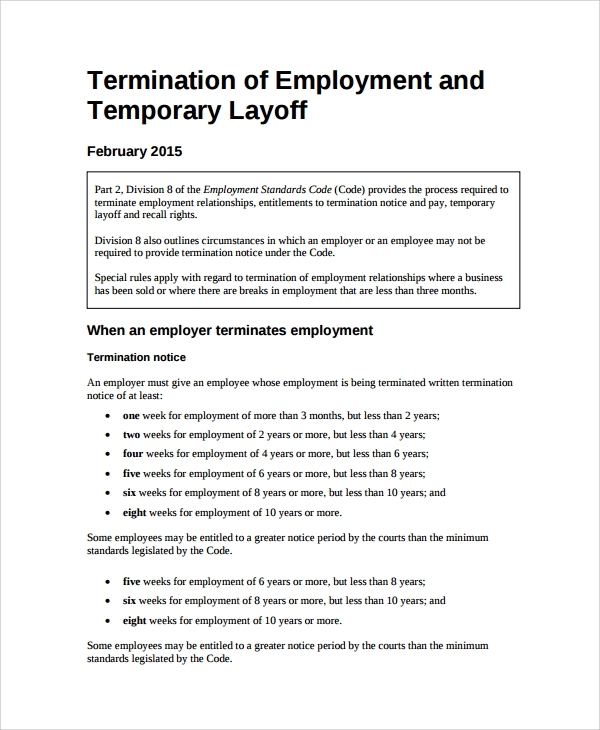 If your company decides to terminate employees due to any reason, and that too in a bulk, in that case providing prior intimation layoff notice is important. 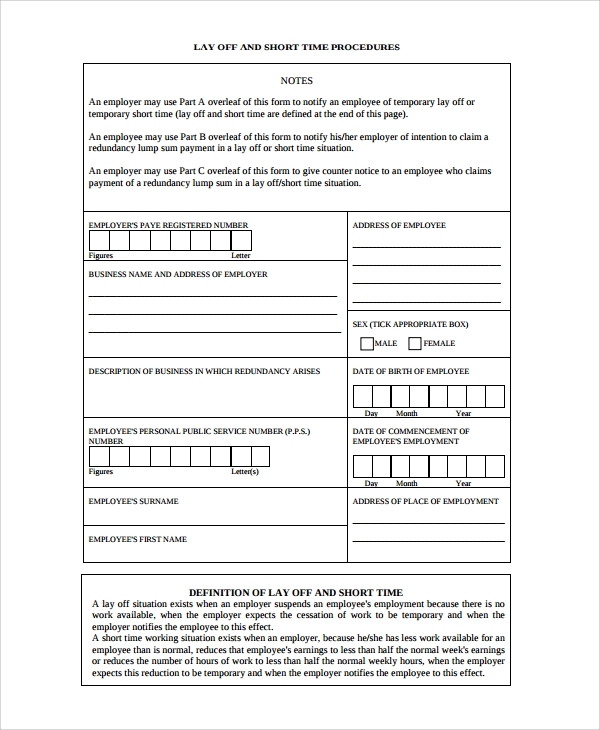 Layoff notice template is also used in case when any employee has performed any abusive or unethical case such as molestation, sexual harassment, theft, etc. In that case, to set an example of strict action against the employee, such kind of layoff notice is used to make other employees aware of such consequences. 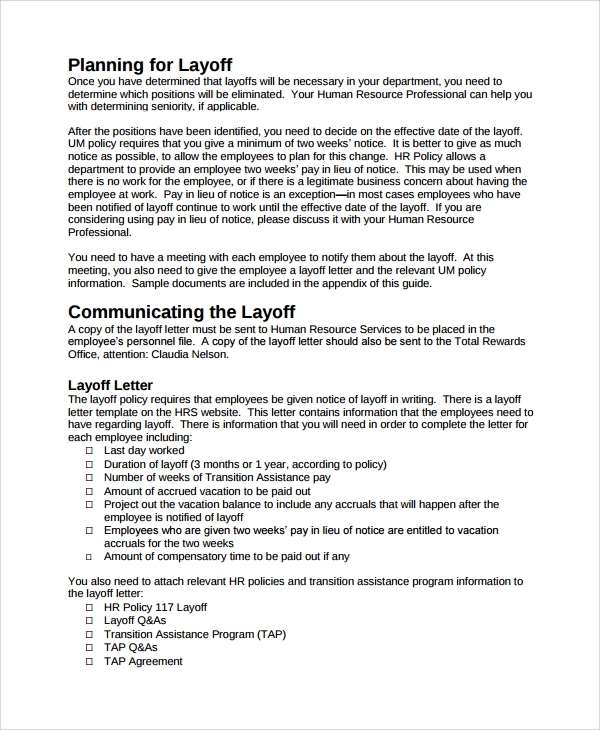 How to create a Layoff Notice? Change the contents as per your company’s requirements. You need to put the reason of layoff, the number of employees who are going to be laid off, last day of service, notice period, the payout date for these employees and other documentation formalities required. Also mention who all are involved in this decision. The layoff notice must include all the necessary information. 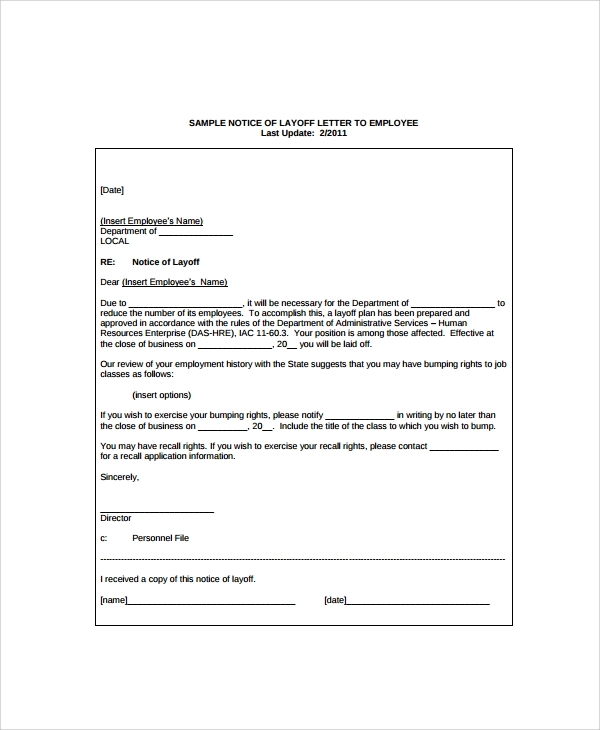 Please go through our section of layoff notice templates and have a quick download of the editable template and use them to get your layoff procedure solved. So come on. 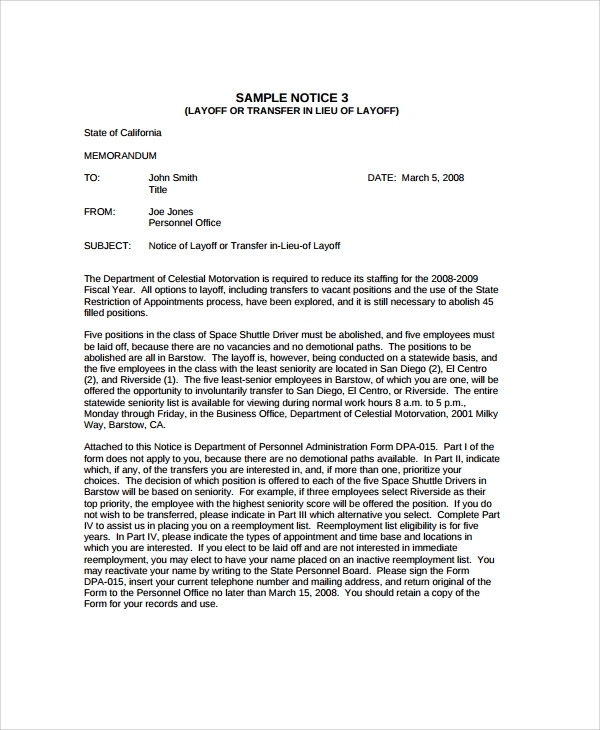 Get the best layoff notice template suitable for your work.